We are a leading Manufacturer of designer salwar suit, new arrival colors patiala house vol-08 dress material, latest printed rang house vol-03 designer suits, rangoli designer suit, new arrival mohini dress material and new arrival sparkle dress material from Surat, India. 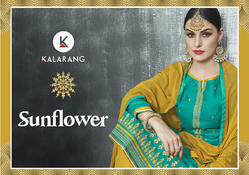 Appear stunningly wonderful in this cotton party wear salwar suit . The beautiful embroiderd work a significant characteristic of this suit. .
Look casual at home, comfortable in office, relaxed for a day out, and glamorous in party with best collection of floral printed cotton suits in this summer. Here is something for all styles, just have a look. We are offering Stylish Cotton Dress Material to our valuable customers while keeping in mind their demand. We offer product to meet the satisfaction of customers by our best product.